I’m in this weird stage in my life right now. I opened my review last week explaining that I’m rapidly approaching my 25th birthday and – much like that one John Mayer song – it appears that the vast majority of my friends and I are encountering “quarter life crises.” Let me preface this with the following: I have a great life. I am, quite truthfully, blessed to have a job (though not in my desired field), health, a roof over my head, and awesome friends and family. My friends and I all seem to be in this weird stage of life, though. We’re at the point where we are no longer defined by what colleges we attend or what degrees we hold. And what’s funny is that in spite of the fact that my friends and I are all vastly different, we can all agree on one thing: we wish we would have been told what it would be like to graduate from college and enter your twenties. No one prepares you, really, for this strange stage of life. We’re adults, but we don’t feel like them yet. We want to make a difference in the world. We want to do something – ANYTHING – to make our lives count. We yearn to travel or go to graduate school or get married and start families because that’s what being in your twenties feels like. It’s a strange mix of all of these emotions that have been buried deep inside of you but have been hiding behind textbooks and thesis papers and part-time jobs. We feel useless when we spend eight hours a day seated behind a desk, staring at a computer monitor. “If only,” we muse, “I could do something worthwhile. If only I could have an adventure in Paris or spend a week tutoring children in Africa. Then my life would mean something.” But our full-time jobs call, our student loans haunt us, and the expectations of what society says a twenty-something should be filter into our thoughts. The characters in this week’s New Girl episode find themselves at similar, albeit not identical, crossroads. Jess spends the entire episode frustrated – she wants to make a difference in the lives of her students and wants to be respected by her principal, but she’s getting absolutely nowhere. So she takes all of the pent-up emotions and frustrations that she feels and transfers them into a side-project. Because if she can accomplish ONE task (getting a new Chinese restaurant to stop delivering so many menus to her apartment), then perhaps she can feel like she’s accomplished something REAL, like she is actually making a difference in the world around her. Similarly, Nick and Coach – with Winston in tow – set out to accomplish tasks this week. Namely, their goal is to get Nick into shape. And while Nick agrees to work out with Coach, it is COACH who has more at stake in their training. Elsewhere, Schmidt refuses to acknowledge the fact that he misses Apartment 4D and his former roommates until the revelation smacks him in the face later on. But more on that later! Instead, let’s take some time to break down the episode in terms of character development, because it was a great one. Before I kick off the review, let me first applaud Matt Fusfeld and Alex Cuthbertson on their absolutely FANTASTIC script this week. “Menus” is, at its core, an episode that revolves around the desire for these characters to BE something and to make a difference no matter how small in the lives of people around them. They don’t want to stay stagnant, really, which I think is pretty great. I only discovered yesterday that this writing duo has also written episodes of Community and Ben and Kate which obviously made me love them even more. In his review of the episode, Erik Adams over at The A.V. Club expressed that he could sense the humor and heart that the writers transferred from their other shows onto this episode of New Girl. Make no mistake about it, though: this is a GOOD thing. Fusfeld and Cuthbertson just don’t understand comedy. I think that they understand how to make an audience laugh but – and here is the kicker – they understand that the characters they are writing for on New Girl are not the characters they wrote for on Community or American Dad or Ben and Kate. The writing duo (though this is their first script for the series, I believe) truly understood who each of these characters were, at their cores. They know the “why” behind the scene: not just what a character was doing, but WHY they were doing it. No element felt out of place or disjointed and, because of this, “Menus” has become one of my favorite episodes this season (only falling behind “The Captain” because… J.J. Philbin). So I extend all of the kudos to Fusfeld and Cuthbertson for managing to not only make this episode hilarious and heartwarming, but also completely true to the characters. In reading through Erik Adams’ review, I saw that he had noted that the prior work on Community may have aided Fusfeld and Cuthbertson in “Menus” by allowing them to filter the episode through the infamous Dan Harmon story circle. 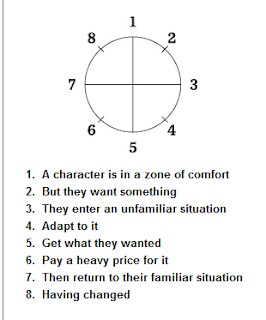 And – because I am crazy – I decided that I wanted to rise to the challenge and see if I could apply the story circle to this episode’s A-story in particular. I think that this episode is truly exemplary of the fact that you don’t have to do much with the characters to do a lot THROUGH them. “Menus” starts off with Nick finding a Chinese food menu beneath their apartment door. It’s early enough in the morning that this sort of thing should not rouse his appetite, but it does and Jess finds him on the couch eating dumplings for brunch. When she explains that she is headed out to meet with Principal Foster about an idea that she has for her class, Nick expresses concern. Nick is, was, and will always be protective of Jess. No matter what happens in their relationship, this is a truth that will never vanish. He cares about her a lot and wants to see her happy and successful. He danced to Taylor Swift for her in “Table 34.” He placed ice on her face in “Halloween.” He was there for her when others weren’t and the fact of the matter is that Nick knows he’s dating an optimist. Nick Miller always sees the worst in people (“because people are the worst!”) but Jess? Well, he knows that Jess will continue to try and try and try until eventually she’s just going to become defeated. And he’s seen her defeated before and cannot bear it because Jess being sad and pessimistic and cynical is like sunshine disappearing. Nick is the jaded one, after all. It’s his job to be the realist or the pessimist or the cynic. But Nick knows that Jess is one rejected idea away from cynicism, so he does his best to prevent her from even trying to approach her boss with the idea for an ocean conservation trip. But Jess, being Jess and the eternal optimist, approaches Principal Foster anyway. It… doesn’t go well. The man insists that he has no room in the budget for transportation for the kids, and Jess is determined to not accept “no” for an answer. She has to, Principal Foster explains, because “that’s just the way it is.” And Jessica Day – the eternal optimist and ray of sunshine – is crushed. Back at the loft, Coach approaches Nick about his eating habits and the latter insists that he doesn’t have a problem, nor does he need to work out. Meanwhile, during their conversation, Schmidt enters the loft and returns his key. It’s an actual big moment for Schmidt (says Nick) because it means that the man is FINALLY moving on from the loft. Schmidt, for all of his faults – and they are numerous – always attempts to mask his pain when in the presence of others. And even though it was his own decision to leave the loft, and even though he knows that it is something that NEEDS to happen in order for him to have both a better relationship with himself and his friends, it is still difficult. So Schmidt pretends that he doesn’t feel left out when he can hear Coach and Nick working out together. He pretends that it doesn’t bother him. But this is Schmidt’s method of operation and it never quite works out for him, as we will see. Eventually he has to admit to the reason behind his actions (sensing a common theme with Schmidt this year) in order to truly grow and develop as a person. Schmidt’s had a rough year already in the fandom, entirely due to his own selfishness. I have to say, though, that I really enjoy seeing episodes where Schmidt is left on his own because though it may not be where HE wants to be at this point in his life, it is where he knows that he – for one reason or another – NEEDS to be. Nick dismisses the need for training, since he’s done just fine for himself and – by his own admission – Schmidt has attempted to help him work out for years, but nothing has “stuck.” But Coach is determined because he doesn’t want Nick to fall into bad habits, like gaining the boyfriend 15. As we learn later, however, Coach’s motivation to help Nick throughout the episode is not really about Nick at all – it’s about HIMSELF. Coach, as we learned last week, just went through a difficult break-up and is wading unfamiliar territory. He’s not sure who he is as a person now that he’s been dumped. But there is one label that he knows to be true: coach. He knows that by helping Nick achieve something, he’s really proving to himself and to others around him that he “still has it.” And, in case it isn’t obvious to you already, this story perfectly parallels Jess’ own storyline this week. Coach motivates Nick with something that is commonly used to motivate Nick Miller. The question is this: does Nick want to be a guy who eats dumplings or a guy who DOES something? (See the thread that’s weaving its way throughout all of the stories?) Nick Miller, in season one, claimed to be the guy who was too afraid to leap, so he stood on the beach and held wallets while others went and lived. Flash forwarding to “Eggs” and “Cooler” and “Virgins” and “Elaine’s Big Day,” we see that Nick’s relationship with Jess (and his growing relationship with his roommates, too) has helped him realize that the kind of person he WAS isn’t the kind of person he wants to become. So Nick evolves and grows and learns to get out of his own head, because Nick is the type of person who over-thinks to the point where he becomes paralyzed by his own non-action. And Nick WANTS to become a “doer,” I really believe that. He just is still navigating the means in which to accomplish this. So when Coach offers those words and his assistance, Nick agrees. Jess, still dejected, is approached by one of her students at school. When the little girl explains how excited she is about their impending field trip, Jess fights to hold back tears, all the while explaining that “anything is possible.” I relate to Jess quite a bit. I’d like to think of myself as always having a positive mentality and optimistic outlook on life. But sometimes the world beats me down and the world beat Jess down, too. So when the teacher returns home to a floor littered with Chinese take-out menus that continue to be slid under their door, she grows irate. And it’s a common tactic, transference, whenever something goes wrong in our lives. Nevertheless, Jess is on a mission and will not be deterred. She enters Hop Foo on a mission – she WILL make a difference. And sometimes, to be honest, that’s all we really want in our daily lives: when everything seems to be going wrong, when situations that we know are out of our control suddenly become even more evidently out of our control, we just need a victory, no matter how small. Jess leaves, confident in her victory after she complains to the restaurant worker, Brian, who assures her that he will fix the issue of the menus. Similarly, Coach is confident as he begins his workout session with Nick. And Schmidt sits alone in his apartment, still begging to be placed on speakerphone so he can feel like a part of the loft. Meanwhile, Jess enters the loft feeling pretty confident. She declares that since she has accomplished one small feat, she can now move onto larger issues like figuring out the situation with her field trip. … Unfortunately at that exact moment, a menu for Hop Foo is slid underneath the apartment door and the young woman takes off running after the employee who placed it there. When Jess discovers that Brian is actually behind all of the menus, she grows irate and focuses all of her energy and efforts (and an awesome mini-rant) into ensuring that menus will not be delivered to her apartment again. Jess is nothing, after all, if not passionate and driven. She is the kind of woman who is resilient, even in the face of adversity and opposition. But the problem isn’t that she’s fighting against a Chinese restaurant that is leaving too many menus beneath her door (something very insignificant and trivial); Jess’ problem is that she tackles an unimportant issue without dealing with the larger one. It’s what all of the characters on New Girl are really great at doing, to be honest. Coach tries to train Nick to make him feel some sort of value and worth as a person in the wake of his break-up. Winston tries to train with them in order to prove that he is a valuable asset to the loft and the dynamic. Schmidt attempts to spy on the loft dynamic but pretend he is fine because his pride and ego get the better of him and he’d rather act that way than admit that he misses his friends. Each of these characters would rather deal with something small and forgo the larger and more complex issue. And that, unfortunately, always backfires. In the loft, Nick and Coach begin their workout. The first few minutes go exceptionally well – Nick is motivated and Coach is spurring him on. But when Coach tells Nick to repeat his exercises again, Nick begins to falter and his motivation crumbles almost instantaneously. The man goes from “doer” back to “dumpling-er” quite quickly and Coach is disappointed. The problem isn’t that Nick cannot be a motivated human being. As we will see later on, Nick is actually quite motivated when it comes to his friends. The problem, then, is the fact that the idea to work out and get into shape was never his to begin with. Nick had no desire to train. He was only excited about it because COACH was excited about it. Nick can be motivated… if it is out of his own free will and volition. But once someone forces an idea inside of his head (the notion that Nick needs to work out), Nick is quick to falter. I believe that Coach does desire to see Nick become a better version of himself. And I think that Nick wants to become a better version of himself as well. The problem, of course, is that a person has to want to change in order to actually change. And while Coach may have thought of Nick’s health throughout their training, the real focus was not on Nick, but on Coach. So the two struggle – literally – over a dumpling, with Nick attempting to eat it and Coach attempting to prevent him from doing so. Winston, meanwhile, is eating the Hop Foo Chinese food when his jaw locks up. It’s because he has an allergy to MSG and Jess – yanking a menu from the table – points out the fact that Hop Foo claimed their food had NO MSG. So Jess redirects her mission once again: if she cannot stop the menus from being delivered, then the best action to take would be to stop Hop Foo’s business. So she sets out to do just that, while Nick – back at the loft – claims that he’s a “dumpling-er,” and is not like Coach. “I tried!” he claims as the latter walks out of the room. And really… Nick didn’t try, did he? Oh, sure, he attempted a few push-ups and jumped rope once. But he didn’t want to put in the effort because, as I said before, it wasn’t his idea to begin with. So he simply didn’t care enough to make an effort. But that doesn’t mean that others aren’t making efforts: Jess is becoming more and more irate and threatens to expose the restaurant using Winston as her “smoking gun,” unless Brian promises to stop. Brian refuses and says that Jess needs to accept that this is just the way that things are. That flips a visible switch in Jess and we come to the realization that Jess’ behavior was never about menus or Chinese food or the injustice of pollution in the environment at all. It was about Jess fighting to control a piece of her life that she could in order to feel a sense of security in controlling the other aspects. It was about her feeling a sense of self-worth and accomplishment for once. But when that is shot down in front of her, she fights back harder. The problem, as I noted earlier in the review is this: while the audience knows why Jess is behaving the way that she is, SHE doesn’t recognize the reason behind her actions and therefore continues to destroy Brian and Hop Foo. Back at the loft, however, Coach is doing what Jess has not: he’s vocalizing the reason behind his intense behavior. He admits to Nick that he’s been off ever since he was dumped and doesn’t quite know who he is anymore… apart from being a coach. If, he explains, he can control that aspect of his life – if he can succeed in that area – then at least he has some sense of who he still is as a person. He lost a lot when his girlfriend left him, and it takes the conversation with Nick to make him recognize that he’s transferring those feelings onto his coaching. At that moment, Schmidt enters and Nick realizes that he’s attempting to continue to spy on the apartment. Nick, from this point forward in the episode, becomes the voice of reason for his friends. It was Schmidt’s decision to move out, he expresses. Later on, Schmidt discusses this with Outside Dave. In spite of it being Schmidt’s decision and ultimately being better for him in the end, he is hurting. Coach has moved into his old room. His friends are having wacky adventures without him. And Schmidt is all alone, discussing his dilemmas with a homeless man who lives outside of their apartment. Back at the restaurant, Jess is learning a hard truth as well: her actions don’t come without consequences. She manages to take down Hop Foo and Brian, but her actions mean that Charles – the person who delivers the menus – will have to be fired. Jess is aghast. She didn’t MEAN for anyone to be hurt apart from Hung Foo as an establishment and Brian. All she wanted was a victory. Unfortunately, Jess forgot that victories always mean that someone is the vanquished. She returns to the loft distraught and defeated, admitting that Nick was right: she should have never tried in the first place. Trying, Jess insists, only leaves you feeling hurt and disappointed in the end when things don’t work out. As Coach and Jess eat Chinese food in their depression, Nick recognizes that his friends’ actions weren’t the only things to have consequences. As it turns out, INACTIVITY can also have as many consequences as actions do. Even though he didn’t WANT to train, Nick didn’t even try. And his attitude did not just affect him – it affected the attitudes and actions of the people he cared about. So Nick attempts to deliver a passionate speech, motivating his friends to realize their potential. Nick Miller is no Jeff Winger, but I think that this is what I really like about him, anyway. I like that his motivational speech is bad. I like that it’s awkward and that he karate chops in it. But what I really like is that it is heartfelt and genuine and gives Jess and Coach the motivation they need. It sparks an idea for Jess as to how she can salvage her field trip, too. Together, the loft roommates and Jess’ class head to the beach in order for the kids to explore the ocean and sand. One of Jess’ students congratulates her on a job well done, but Jess passes the compliment to Nick, insisting that HE is the one to make the trip possible and he was the one to make the difference. Nick contemplates how it feels to make a difference in the lives of others and concludes that it is a good feeling. In fact, it is something that makes him feel like running. So, with Coach’s guidance and Winston’s failed attempt to roll his wheelchair along the sand, the boys take off down the beach. Schmidt approaches Jess, then, and the two have a pretty awesome moment when Jess hands Schmidt his key back and explains that they all like having him around. It’s a little glimpse of genuine friendship that I’ve missed between the two. And it was a perfect element to add into this episode.